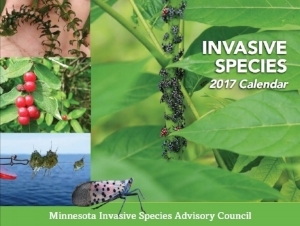 MISAC creates educational invasive species calendars highlighting invasive species issues in Minnesota. 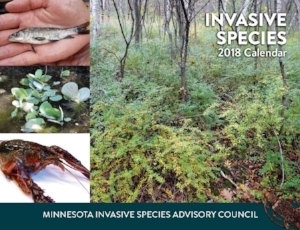 Species featured include species that are already present in Minnesota and species that are problems in other states that we can work to keep out of Minnesota. Additionally, pathways by which invasive species can spread are also featured. You may download posters and print out pages for yourself. Contact a MISAC co-chair for a copy of the most recent calendar. Brown marmorated stink bug, Oriental bittersweet, Faucet snail, Felt-soled wader pathway, European frogbit, Japanese beetle, Bighead and silver carp, Grecian foxglove, Live study specimen pathway, Khapra beetle, Mute swan, and Purple loosestrife.